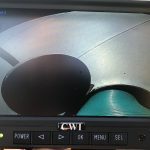 We have been successfully supplying cameras for placement in grain tipping bins for about 15 years now. Now with Wireless technology it is possible to place a camera on the end of an Auger, up to 110 foot Auger so far, and stay on the ground watching the grain flow with the screen being powered by a small battery pack. No more rushing up and down silo ladders to shut of the grain flow, or even chocking of augers because you can stay in control from ground level and know how the silo is filling. A cheap investment for a lot of uses.